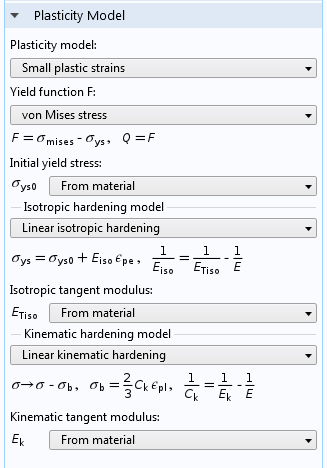 For users of the Geomechanics Module, COMSOL Multiphysics® version 5.2a brings extended features for modeling hardening in elastoplastic materials through the ability to mix isotropic and kinematic hardening in the Plasticity model. For elastoplastic materials, hardening features have been extended to allow for arbitrary mixtures of isotropic and kinematic hardening in the Plasticity model. In previous versions, plastic hardening could only be described by either isotropic or kinematic hardening. By allowing mixtures of these two models, you can perform more realistic simulations of loading-unloading situations. Settings for the Plasticity node with both the Linear isotropic hardening and Linear kinematic hardening models activated.